We are backed by a modern transportation facility that ensures safe delivery of the orders at required destinations. With substantial warehouse that is sprawling over large area, we have the capability to partner with management in performing the detail processes that require handling of the tasks such as sourcing, inspection, internal replenishment to picking positions, packing and shipping. 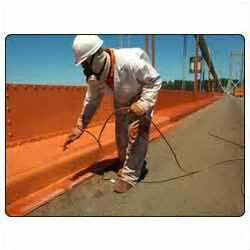 Our Water Based Red Oxide Zinc Chromate Primer Paint is largely appreciated for its high-quality.